John writes, "This is the boldness that we have toward God, that if we ask anything according to his will he hears us, and... whatever we ask, we know that we have the requests that we have asked from him" (1John 5:14-15). John has made a wonderful promise. However we must understand that the "boldness" John refers to is confidence, but not presumption. We cannot presume that God will do anything we ask, just because we want him to. Our prayers have to be "according to his will." But God’s answers don't have to be according to our will. God cannot deny himself (2Timothy 2:13, Titus 1:2). The scriptures cannot be broken (John 10:35). God’s will is immutable (Hebrews 6:17-19). Prayers must harmonize with the declared counsel (or will) of God (Acts 20:27). God cannot say one thing and do another. He cannot go against his revealed will. God has a will in some things which is not revealed to us, so we cannot know it. God has revealed only as much of his will for us as we need to know for our own good. For example, the duration of our lives is unknown, and what will happen tomorrow is unknown, and we ought to say, "If the Lord wills we will live and do this or that" (James 4:13-15). We must respect the unrevealed will of God, even though we cannot know it. For example, Paul sought prayers regarding his life and ministry, but he did not know everything that lay ahead of him (Acts 20:22-25, Acts 21:10-14, Romans 15:22-33). The Lord Jesus showed the right attitude: "Father, if it be possible... nevertheless not my will but Your will be done!" (Luke 22:42). Is that the attitude in which you pray when you do not have God’s will revealed? 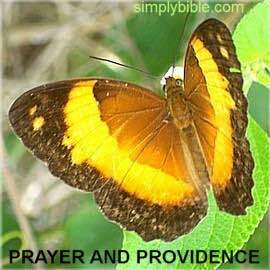 When we pray, do we imagine Satan takes no notice, and does not try to hinder our prayers and God’s providence? And if, in our ignorance, we ask something that would help Satan, do we think God will grant it? God will surely do one thing: he will "crush Satan" (Romans 16:20). It may appear that God does co-operate with Satan. The best example of that is the cross of Christ. It was God's will that Jesus die, yet he died by wicked hands (Acts 2:22-24). However God and Satan were not co-operating here nor at any other time. It's just that, even when Satan does his worst, God can still turn it to his own good and win the victory over Satan. Prayer contributes much to this outcome. God's will is that all men be saved (1Timothy 2:3-4, 2Peter 3:9). Paul prayed that Israel might be saved (Romans 10:1). But Israel's will was contrary (Romans 10:16, 21). God forces no one to be saved against their will. Of course he will not leave anyone free to rob someone else of their salvation against their will either (John 10:27-29). When we pray, we must take into account the interaction of all these wills with our own. God surely does. 1. How many of the requests we make to God will he grant? 2. How much of God’s will for me has God revealed to me? 3. What will happen to a prayer that is not in harmony with the revealed will of God? 4. Can I pray about something when I am uncertain of God’s will? 5. What is God’s will generally concerning every person? Is it that they live untroubled lives? 6. What is meant by free will? Free to do anything you like? Free to rob others of their salvation? 7. Why does God want us to pray? 8. What should be our attitude toward God’s unrevealed will? 9. What sort of "boldness" do we have toward God in prayer, and from what must we distinguish this boldness? 10. What is the primary good for which God causes all things to work together? 11. Summarise the points we made regarding how various wills interact and how they affect God's answers to our prayers.